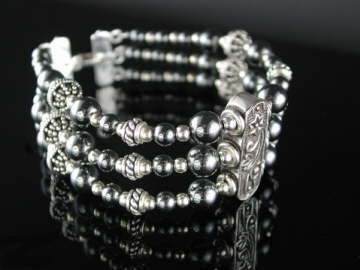 Exquisite triple strand Hematite bracelet, set with 925 sterling silver Balinese beads and featuring a beautiful and ornate, handcrafted, spacer bead in 925 sterling silver (see front right of picture). Hematite is Iron Oxide and takes its name from the Greek work for blood, 'haima'. At first glance this may not be an obvious name; with its silver appearance, but in its natural, fine-grained form it is blood red! Following an unmanned expedition to Mars in 1996, a probe analysing mineralogical samples collected from the surface, found both fine- and coarse-grained Hematite. Fine-grained Hematite is red in colour, with coarse-grained being a silver-grey. It is the fine-grained Hematite being blown around during the seasonal Martian dust storms which gives Mars its characteristic red hue, giving rise to its nickname, ‘The Red Planet’. Legend has it that Hematite formed in the ground from the spilt blood of wounded warriors in ancient battles; their spirits imbuing the crystal with protective properties never afforded to their bodies as mortals, and this is, indeed, a wonderfully protective stone, sending low-vibration and negative energies back to their source. It is also a super grounding stone. When one of the Patinkas team was first experimenting with the otherworldly energies of Moldavite, she found she was unable to wear it without experiencing an extreme out of body sensation; as if ‘floating away’. She found that by tucking a small piece of Hematite in her boot, it kept her grounded whilst she was familiarizing herself with the energies of Moldavite. Physically Hematite can be used to treat all disorders of the blood and is also said to be excellent for post-operative use, especially when the procedure involves the main organs, deep cavity penetration (stomach and chest ops) or tumor investigation or removal. This bracelet has an ornamental hook and loop sterling silver clasp.